On July 10, NASA’s Juno mission flew by Jupiter (at about 2,100 miles from the surface) and took snapshots of its infamous dark crimson spot. The images depict a gorgeous series of venous clouds webbed through the spot. It is 10,159 miles wide, which means that it is 1.3 times as wide as Earth. Astronomers have kept a close eye on the spot since 1830, but in modern times it appears to be shrinking in size. Scientists have been curious about this iconic mark for hundreds of years and are counting on these new photographs to offer some revelations about the phenomenon, such as new information on origin, structure, atmosphere, and magnetosphere. The Juno mission team called on citizen scientists to help process the pictures to produce a more detailed image that will be easier to analyze for the team. 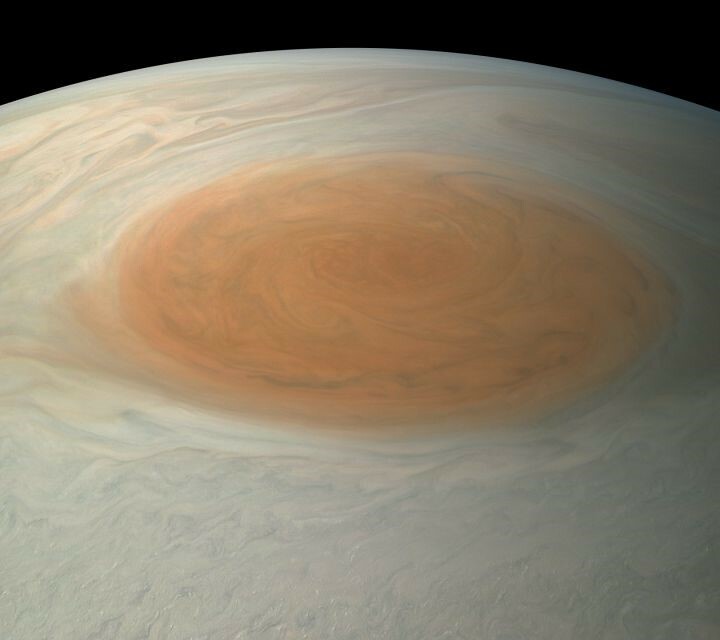 The color-enhanced picture shown here was edited by citizen scientist Gerald Eichstad in a manner intended to draw the observer's eye to the storm and turbulence surrounding it. The more monochromatic picture, on the other hand, was edited by Bjorn Jonsson to offer a natural color rendition of how this feature would appear to the human eye from Juno's point of view. Both the raw images and the processed images can be found at this link: https://www.missionjuno.swri.edu/junocam/processing.